The Grip gaming seat has been designed to allow the player to adjust the seat height and inclination. The backrest, as well as being reclinable, also has micrometric lumbar adjustment. 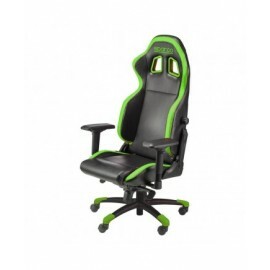 The gaming set is upholstered with the same synthetic leather used for after-market automotive products that guarantees excellent wear resistance. Besides being easy to wash and clean using just a damp cloth, synthetic leather has excellent durability. The gaming seat has an anti-roll device with backrest lock at 150° and a SGS / BIFMAX5.1 / EN1335 certified piston base, as well as a tilting mechanism and polished aluminium base with 5 solid wheels. TPU heal support to avoid the feet slipping while using the gaming seat.